Farming is a dying tradition, not only in Wayne County, but across the country. Many students who grew up in Wayne County, have parents who are farmers or grew up around agriculture. Officials at Honesdale High School wanted to give these students a chance to pursue an education in a field that's been critical to life in Wayne County. This year, a new agriculture program was rolled out in the school. The program includes animal science, forestry and natural resources and even food processing. 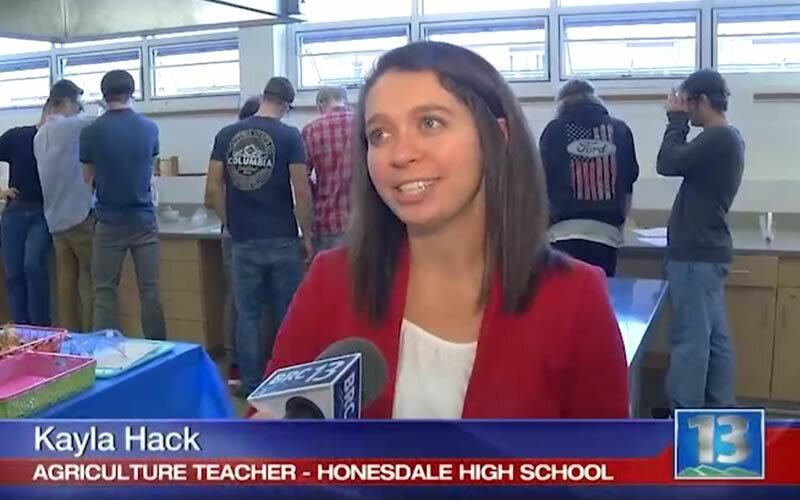 Kayla Hack is the new agriculture teacher at Honesdale High School. Hack says it was important to give the students a well rounded education that encompasses everything related to agriculture. " I always say that agriculture is everything from the clothes you wear on your back to the food that you eat, so I wanted to make sure to include everything. Its not your traditional classroom setting either. The students spend their day on their feet instead of glued to a textbook. Its the atmosphere Hack says she wanted to create to make the classes more hands on. " Typically you don't get to use a chainsaw in class or use a biltmore stick, or go outside and identify trees, but in this course you get to do all of those. " Honesdale is the first high school in the Poconos to offer a a career focused agriculture program, Hack says she hopes teaching this can restore a dying tradition, that has been the backbone of Wayne County for centuries. " The community is excited about it, people have said thank you so much for bringing this back here"
Hack tells us the agriculture program hopes to expand next year. The High School will offer an aqua culture course along with several advanced agriculture classes.